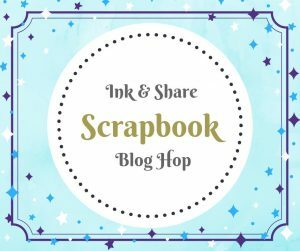 Welcome to another Ink & Share Scrapbook Blog Hop. Whether you have joined me from Karen or starting the blog hop with me I hope you enjoy my project. This month’s theme is Fall in in England Autumn. It is currently the start of Autumn in England and the trees are slowly changing from shades of green to shades of yellow, orange, rust and red. During my September card classes I used the Sheltering Tree stamp set as I had not used it and loved how the card samples turned out. I decided to use it again for my Autumn themed scrapbook page. For my page I stamped the tree and branches in Black Memento Ink. The trees were then stamped using the following inks – Garden Green, Crushed Curry and Cajun Craze. Some were stamped straight onto the branches whilst others were stamped 2nd or 3rd generation. The photo was mounted onto Crushed Curry and Cajun Craze card stock. The 3 leaves were stamped using the baby wipe technique. This technique is where you add drops of reinker onto a baby wipe then using the baby wipe as an ink pad. I used the plain leaf stamp from Colourful Seasons to stamp leaves onto Whisper White cardstock and die cut the leaves using the matching dies. These were then stuck onto the page. Finally I needed a title but wanted to keep it simple as I did not want to overshadow the rest of the page. 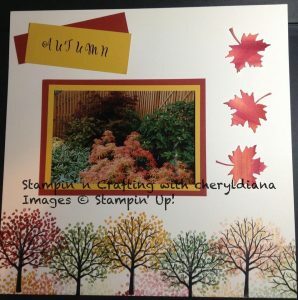 So using the Cajun Craze and Crushed Curry cardstock to cut rectangles I stamped the word Autumn using the Make a Difference stamp set. Now that you have seen my scrapbook layout I hope that is has given you an idea of what you can do. Please do leave comments as you go round the Blog Hop. Please click on the NEXT button to visit Lisa and see her scrapbook page. Love your custom colored trees!